When you learn to ride a horse, your first step after mounting and learning to sit correctly will be to cue the horse to walk. And, for safety's sake, you really have to understand how to halt before you walk! Only then can you use natural aids—cues that come from your body—to start out at the walk. Even at a slow walk, it's important that you work at maintaining the proper position so it's easier for your horse to understand what you want it to do. Gather your reins so you feel a light contact between your hands and the bit. Use both lower legs to squeeze the horse lightly behind the girth area. Your leg above the knee should remain motionless. At the same time as you cue with your legs, cue with your seat by pushing forward slightly with your seat muscles. Some horses are less willing to move forward than others. If your horse doesn't begin to walk, try nudging with your lower leg. If that doesn't work, urge the horse forward with your heels. Your hands should follow your horse's head as the neck naturally extends to move forward. Stop cuing as soon as the horse responds. You will find there is a slight rocking motion to the walk. Allow your body to relax and follow the movement of the horse. 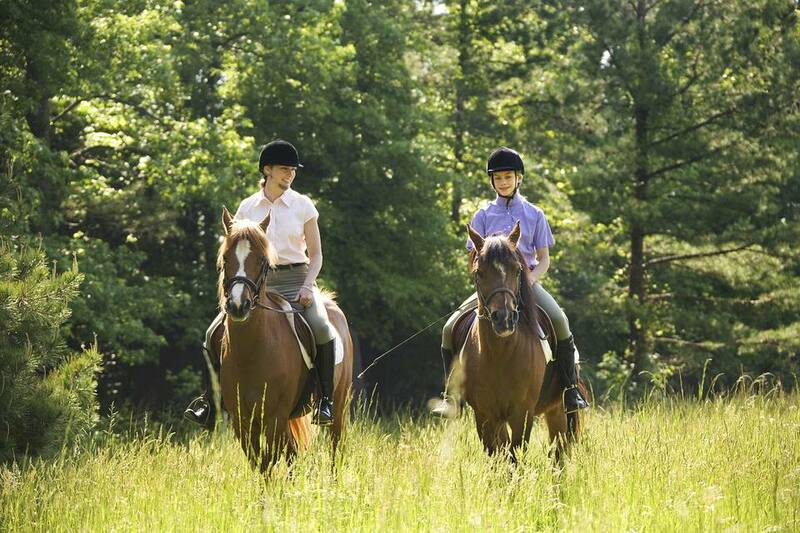 If your horse starts to fade, try cuing lightly before the horse has decelerated to a complete stop. While you are riding a horse at the walk, it is essential that each part of your body maintains a particular position. At first, you will want to be very mindful of how you're holding yourself, but with time it will become second nature. Head: Look forward in the direction you want to go. Don't look down as that stiffens your spine. You want to remain relaxed and supple. Shoulders and Arms: Maintain good posture and carry your shoulders evenly. A crooked rider will influence the horse, making it harder for it to understand some of your commands. Your arms should be relaxed at your sides, with the elbows bent, so there is a straight line from your elbow to the bit in the horse’s mouth. Seat and Back: Make sure you are sitting square in the saddle, and that your balance is not shifted to one side. Again, a crooked rider will make a crooked horse. Legs: Keep your lower leg quiet unless you are actively cuing the horse. Don't let your feet slide forward so that you are sitting "chair seat," or let your legs swing. When you are looking downward, you shouldn't see your toes. Don't let your thighs, knees, or feet turn outwards as this weakens your seat and makes cuing more difficult. Hands: Your hands should be steady with light contact on the reins. As the horse walks, its head will move slightly with each step. Follow this movement as you hold the reins by flexing your hands and wrists slightly. When riding with a Western-style curb bit, you will use a looser rein and not maintain direct contact with the bit. Neck rein by holding the reins in one hand but ensure that your shoulders are always square and even with one another. Some riders hold their free arm bent at the elbow and across the front of their body. Others let their arm hang straight down. When you first begin riding, you will feel awkward. You may feel unable to make all your body parts do all the things they are supposed to at the same time. It's also likely that your muscles will not be familiar with the job you are asking them to do. The key is to keep practicing so you develop the muscle memory needed. As you continue learning to ride, your skills, strength, and coordination will increase, making your cues almost imperceptible. You may be anxious to go faster. But working at the walk allows you to increase your coordination, balance, and security, which will help you become a better rider overall.